Tusayan Polychrome bowl from the Museum of Northern Arizona collections. Click the image to open the Tusayan Polychrome gallery. 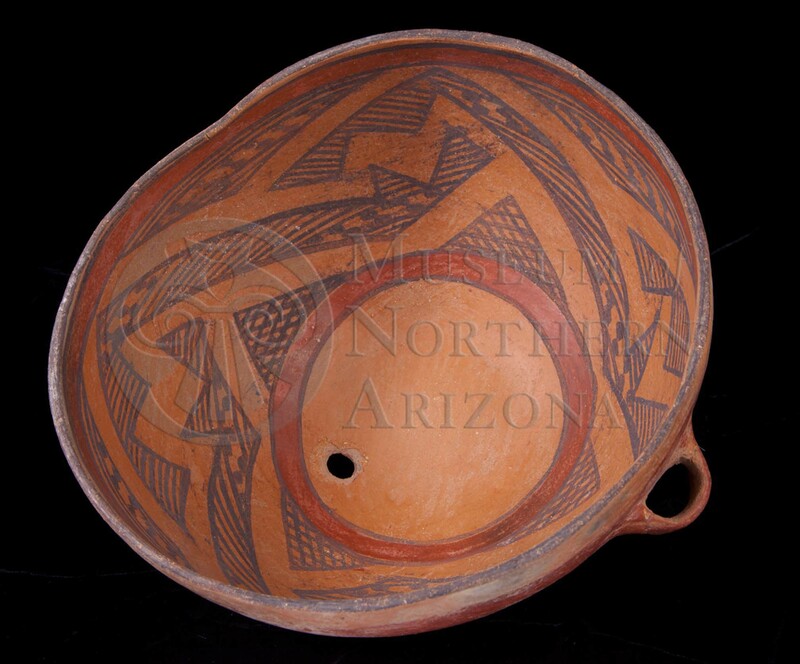 Tusayan Polychrome is a type of Tsegi Orange Ware found in northern Arizona from the San Juan River to the Little Colorado and east to Chinle Creek. This type was also a fairly common trade ware. Date Range: Kayenta Heartland: A.D. 1110-1320 (Christenson 1994), Flagstaff Region: A.D. 1125-1250 (per Christian Downum, Northern Arizona University). Firing: In an oxidizing atmosphere for the final stages of firing. Core Color: Black to gray, dark brown to brick-red. Temper: About equal quartz sand and light colored angular fragments (sherd). Surface Finish: Bowl surfaces, sometimes bumpy; polished; scraping and polishing marks sometimes noticeable; decorated surfaces compacted. Surface Color: Orange; color surface and core generally do not contrast. Forms: Bowls, dippers, jars; bowls generally have a horizontal handle. Vessel Thickness: 2.8 to 7.7 mm; average 5.5 mm (bowls); 3.7 to 5.2 mm; average 4.5 mm (jars). Pigments: Black: manganese, red: hematite. Design: Style A: Broad red bands outline interior of bowls. Style B: Interior bowls, exterior jars; red, vertical, horizontal and diagonal stripes, often encircling stripe just below rim on bowl exteriors; black, narrow lines outlining red areas on bowl interiors, horizontal and diagonal hachures in rectangular or triangular panels between red areas, narrow horizontal lines in series, wide staggered lines, vertical lines in series with staggered lines between; bowl exterior, one to three wide horizontal stripes just below rim; rims usually red or black. Styles A and B may be combined in the same vessel. Comparisons: Tusayan Polychrome Style A and Citadel Polychrome are much alike and frequently confused if sherds are small as basic design inside bowls is similar. Citadel Polychrome bowls never have horizontal handles, outside of bowl is slipped although a small area on bottom may be left unslipped while Tusayan Polychrome has outside unslipped, being decorated with one or two wide bands of red. Tusayan Polychrome Style B on bowls may be confused with Cameron Polychrome which has hachures in black similar in style to Tusayan Black-on-red on areas left free of slip, has a slipped exterior and never a horizontal handle. 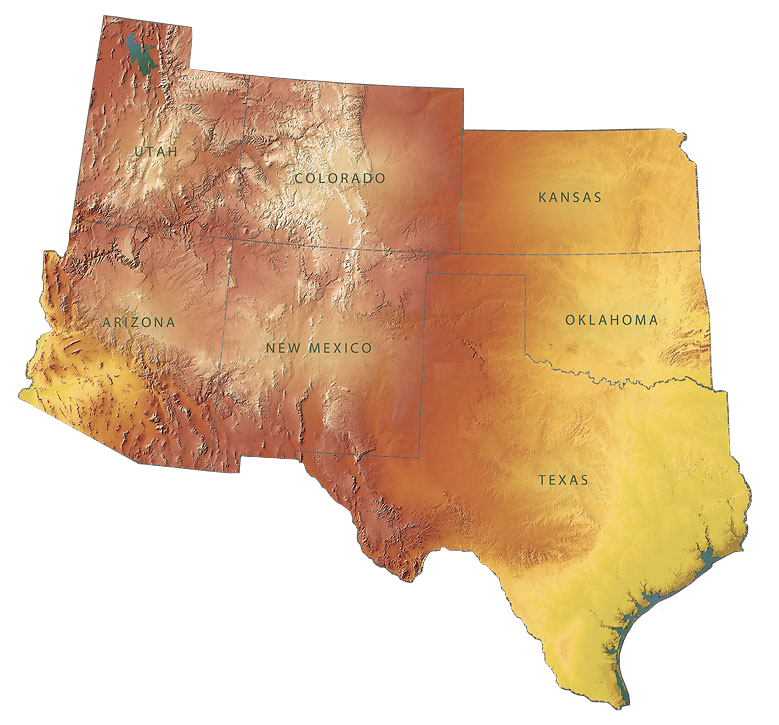 Other Names: Proto-Kayenta Polychrome, Proto-Kayenta (Tusayan) Polychrome 3.